Raymarine Dragonfly has an average rating of 4.5 out of 5 based on 4 user reviews. The Raymarine Dragonfly is a combination of GPS and fish finder, making it an ideal tool for those who want a bit more fishing success even in unfamiliar waters. At just over $700 at most retailers, it is still considered an “affordable” model, and is packed to the gills with features. The most relevant to the average angler is going to be the sonar feature. The device’s “DownVision” technology helps to bring in remarkably clear images on the 5.7-inch screen, allowing the user to get a good look at where fish might be hiding. Also of note is the GPS acquisition—it picks up signals quickly and has a fairly large library of US coastal and inland waters upon which you can rely. The DragonFly brings a new technology – CHIRP – that until now was only available on high-end fishfinders that cost thousands. Unlike traditional fishfinders that use single or double frequency, the new Raymarine model uses a range of frequencies at the same time. CHIRP stands for Compressed High Intensity Radar Pulse and is considered by many the future of sonar fishfinders. The other major feature that should get users excited is the screen itself. It has remarkably high resolution for a screen of its size, even when the sun is shining directly onto the screen. Coupled with the slightly larger than average screen size, this makes for an intriguingly useful device for the price point. The Dragonfly is frequently compared to finders in the the Lowrance HDS Series. All three devices are in the same price bracket, and all three function in a remarkably similar manner. The Dragonfly’s main edge over the competition is its screen size (5.7 inches versus 5 inches) and in the fidelity of the screen. The Garmin series tends to have a slightly better GPS function and the Lowrance might be a few dollars cheaper, but the Raymarine does tend to be the best of its class when actually taken out on the water. The Raymarine DragonFly 5.7 is one of the better GPS/Fish finder combinations available at its price point. Its fish finding core is more useful than one would expect in a lower-priced model, while the GPS is just useful enough to help you stay on course no matter what happens. While there are certainly more sophisticated fish finders available, there are very few that are going to give you the same kind of value for your money. Whether you are experienced at the sport or looking to head out on the water for the first time, the Raymarine DragonFly will make you a bit more successful than is otherwise possible. You can get a great deal on Raymarine Dragonfly here. The best feature in this unit is the joystick which makes it very easy to use. The display is very clear and crisp, readable in bright sunlight. The sonar tracks the bottom very well but it has tendency to black out at times. Another drawback is that the GPS doesn’t seem very accurate. My biggest problem is the mounting bracket – the unit is very difficult to dismount. Overall it’s not a bad fishfinder but I should’ve bought a side-imaging Humminbird. I got this unit about a week and used 3 times so far. This thing deserves to be called a FISHFINDER. You can see the fish arches clearly, no doubts or guessing. 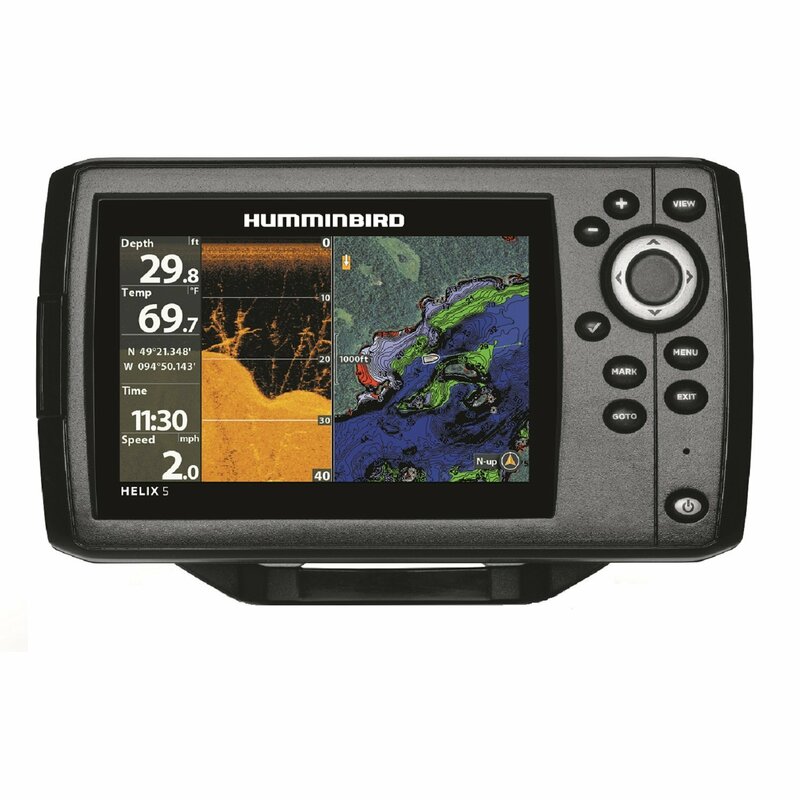 If you’re fishing in shallow water (less than 200 ft) this unit is the best fishfinder for you. The display is great, very easy to use, especially if you’ve used an IPAD before. I was hesitant about buying this unit because CHIRP is a new technology that hasn’t been available at this price. It turns out this is a great product. Sonar accuracy is hands down the best of any fishfinders I’ve used before (HB 798, HDS 5, Garmin 550). If Raymarine comes up with a 10 inch display for this transducer they will take over high end market, nobody will be able to beat a professional angler equipped with that. This unit works great and it truly is a good as advertised. I was surprised, however, when I found out that it doesn’t support NMEA2000 connections. I assumed Raymarine puts NMEA connectivity on all their units, not so with Dragonfly. Also, the unit doesn’t come with a printed manual or head unit cover. Again, I would expect that to be standard on any $700 piece of marine electronics.